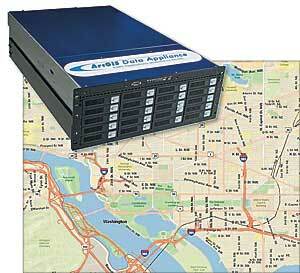 Detailed street map data delivered on INLINE Corporation's network attached storage (NAS) device. The ArcGIS Data Appliance is designed for organizations that want to provide secure access to a comprehensive collection of geographic data, such as imagery and streets, to their users. The data delivered with the appliance is the same data ArcGIS users are already accessing through ArcGIS Online. However, while ArcGIS Online is hosted by Esri, the ArcGIS Data Appliance lets organizations host this prerendered and precached data collection on their own secure ArcGIS Server behind their firewall. Optimized for publishing with ArcGIS Server, the Data Appliance combines data and hardware that fit easily into an organization's existing IT infrastructure by connecting directly into the existing network. Multiple divisions, departments, and client applications can now efficiently share a common information architecture and a set of mapping and visualization services that can be extended by combining them with a user's own data. Users can choose from four different data collections that are preprocessed and preconfigured on an INLINE Corporation network attached storage (NAS) device: the World Collection, USA Prime Imagery, USA Imagery, and USA Street Map. These collections can be purchased separately or as a complete bundle, depending on the user's unique business needs, and range from $20,000 for the World Collection to $57,000 for the USA Prime Imagery collection. The World Collection includes satellite imagery for the world down to 15-meter resolution; a seamless world street map with highway-level data and other transportation reference layers; and physiographic, political, and shaded relief maps. Altogether, the World Collection comprises one terabyte of prerendered data, cached at multiple scales for display as 2D and 3D services. The USA Prime Imagery collection offers a seamless mosaic of 1-meter resolution or better aerial imagery for the contiguous United States along with satellite imagery for the world at 500-meter and 15-meter resolutions. The high-resolution imagery is provided by commercial and government entities, including recent submeter commercial imagery for many metropolitan areas and the best available government imagery for other areas. Together with topographic maps for the United States, a Natural Earth physical map, general boundaries, place-names, and transportation reference layers for the world, this collection comprises more than eight terabytes of data for display as 2D and 3D services. The USA Imagery offering includes a seamless mosaic of 1-meter resolution aerial imagery for the contiguous United States and 500-meter and 15-meter resolution imagery for the world. This more than six-terabyte dataset also includes topographic maps and other reference layers but differs from the USA Prime Imagery collection in the currency and level of resolution of its aerial imagery. The USA Street Map collection provides a seamless, multiscale street map for the United States with highways, major and minor roads, railways, water features, and more overlaid on shaded relief imagery. This one-terabyte dataset also includes a complete world street map with highway-level data and other reference data for display as 2D and 3D services. To learn more about the ArcGIS Data Appliance, visit www.esri.com/dataappliance.